A U.S. fleet replenishment ship given to Chile will undergo a $30 million reactivation job that's expected to last three months. The USS Higgins would then set sail for Chile in February, according to the Mobile, Ala.-based Press-Herald. The Higgins has been mothballed since 1996. Its transfer to Chile's navy was finalized a year ago, as Chile's Defense & Military reported. The transfer was free, but required all reactivation work to be done by U.S. companies. Chilean sailors have already done some training on the vessel. Chile is hosting joint exercises this month with the air forces of Brazil, Argentina, France and the U.S. The exercise is meant to develop teamwork, but the big story is the hypethetical conflict dreamed up. The scenario: a northern aggressor is defying international treaties and must be dealt with. That wasn't lost on Peru, which is disputing its ocean boundary with Chile. Chilean officials sought to smooth things over by inviting Peru's air force to observe the exercise, called Salitre. Peru declined and complained to one of Salitre's participants, the U.S. American officials nudged Chile into altering the scenario, according to El Mercurio. The Chileans obliged. No more northern aggressor. More units of Chile's armed forces are using the M4 carbine, the standard infantry weapon of U.S. forces and other nations. 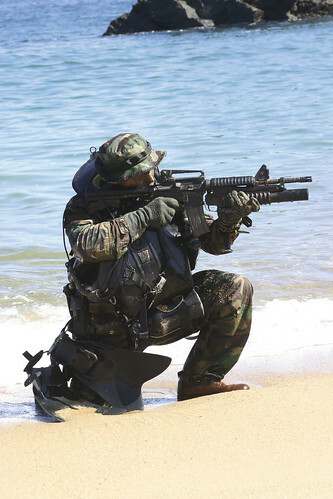 The marine special forces is one such unit, as seen in this photo. (The weapon is seen fitted with the M-203 grenade launcher.) The M4 has its share of critics, though. Some soldiers complain it jams frequently in dusty, desert areas. U.S. troops in Afghanistan say their guns have malfunctioned at critical times. With similar conditions in the north of Chile, is the M4 the most adequate rifle? Most Chilean army soldiers still employ the SIG 540 5.56mm rifles, built under license by Famae. Rumors of Chile acquiring the HK416 or the SIG556 haven't materialized. UPDATE: Chile is seeking to acquire up to 15,000 assault rifles to replace older ones, Enfoque Estrategico reported. A competition between the Colt M4 and the Heckler & Koch G36C is planned.